A Smart Television Show about Dumb Hollywood! 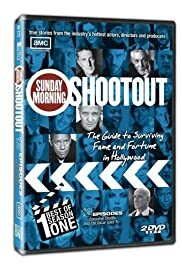 This morning, the show displayed two of Hollywood's expert insiders on the business of movie-making, Peter Bart, and the other guy whose name escapes me. They were discussing about why the Oscars were so bad this year with low ratings. Of course, if you had Larry the Cable Guy, Jeff Foxworthy, Ron White, and Bill Engle as hosts of the Oscars or any awards show, maybe the ratings would have increased. The movies were not that great last year for starters. It was kind of a bad year in the film industry. As an outsider since I live and work outside of the industry but I have observed the entertainment industry since I was a kid. I do believe that most of us outside of Hollywood and New York City are somewhat disenfranchised and disenchanted with the industry itself. People like myself have other concerns. Of course, we go to the cinema to escape reality but we don't need to be preached too. I'm still puzzled why Sicko lost in the best documentary category. When you look at television programming in particular, there is this enormous focus on sexuality in almost every television show whether sitcom or drama. There is a recession going on right now. 50 million people by liberal estimates are uninsured. The gas prices are rising and there is two wars that America is fighting in. At home, there is a war between the elitist liberals and I include myself as a liberal lefty in that category but I have tried to understand where people are coming from. While the same disenfranchised hard-working people are struggling to survive, they are constantly reminded of issues that don't concern. They are being preached too like children. The audiences today are quite sophisticated with internet and computers anyway. I don't want to spend time and money on a film that will only depress me. I want to escape after all away from the sad reality that faces me outside the theater. Instead of trying to come up with bad movies, maybe Hollywood should swap lives with hard-working middle class people. That would be a great television show or movie I can watch.